You know you are buying too much stuff when there’s a backlog of packages to be opened. I almost miss the days when I would tackle something I get in the post with glee and anticipation. I say almost because I still do on occasion, depending on what I’m getting. I remember getting my N1 last year, that was like Christmas in March. I remember getting my Rakkyo box, but that was more me gawking at the amount of disrobing required to get to a few, simple plastic discs. It’s been a while since I had to do that. There were others but they were few. 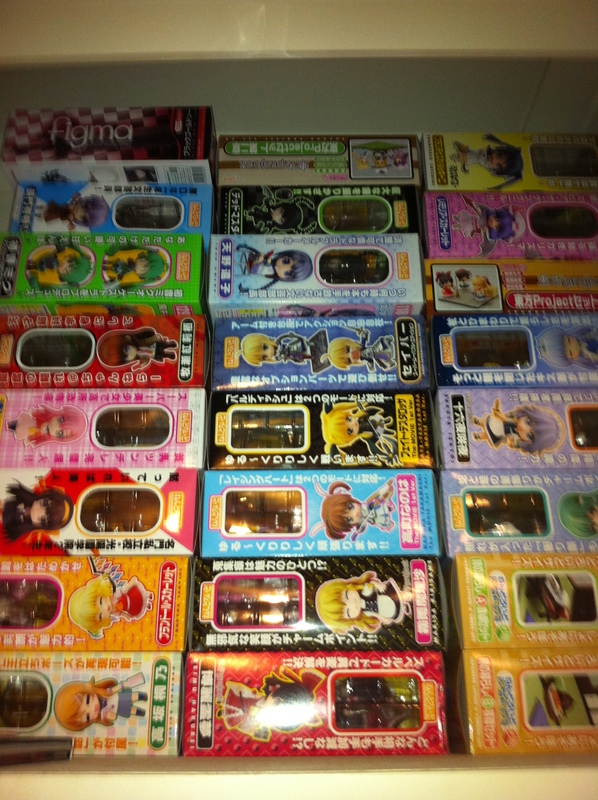 The sad thing is, being an anime nerd and collector invariably meaning buying your own loot. It’s something that can’t be avoided, and in fact when you collect seriously, it is part of the art. For the truly serious, it’s gotten to a point where you talk to other collectors and buyers and do it like a MMORPG: via teamwork and/or by proxy. It’s complicated. The issue I want to examine is how to recapture the same joy we all experience when it happens. It’s Christmas every month or every week, for some people, when they bulk ship from your favorite e-retailers here and abroad. Things like Amazon Prime are basically taking the joy out of shipping (and making it a seamless process). It can’t help but to feel that after a while, it just doesn’t matter anymore. #firstworldproblem indeed. And who should be interested? Those who wants to look at the bright side of life aside, probably retailers. And no, I’m not advocating you should buy each other loot, to somehow salvage this sorry situation. I’m talking more about making the buying experience a little less mercenary and a little more magical. I collect DVD and Blu-ray Disc media: I buy to archive. It’s not a surprise that probably a good 1/3 of my collection is still shrinkwrapped. So when I get a package of something like that I systematically process it and store it somewhere. It’s only when I end up buying something I found particular attachments for, that I stop and smell the roses. Or maybe I should just slow down, make less money, consume less anime, or some such. But what I find overwhelmingly today is that most SKU from R1 publishers are these no-nonsense stuff, these budget super-econo-bargain sets. We all love a good bargain, but for the archiver they literally are just that: data on a disc. Of course, it didn’t help back in 2005 when there were some value-added incentives, like CDs (more data on a disc!) or T-shirts (worthless and kind of unremarkable, like cheap promo items) or flimsy cardboard crap (lol gondola). Sorry, but no. The irony is Japan is awesome at making such purchases “value-added.” If you can import anime, why don’t you guys import this other paradigm at retail as well? It feels entirely against some notion of old-timer otaku, the ones that best described by the likes of Satoshi Kon (RIP) when he talked about his younger days, how Japan, back then, is not a rich or affluent nation. Anime was something that happened once a week on TV, and for a school boy that’s going to be a short 25 minutes of joy to last through a whole week. In comparison we (of the 21st century) are living life in a very different way, yet it’s only in such a prosumer perspective that we can see how awkwardly out of line we are with how things used to be. I want to savor the experience. Isn’t this something obvious? Why is almost nobody selling it? Or are we too accustomed of doing it ourselves for cheap? Sorry, but as much as people are good at it, it still falls short at a pro’s take. I guess that’s part of the problem too, right? That there are no pros working at this in the anime space, sans importing from Japan. Granted, I don’t know if that’s a good or a bad thing–probably neither. But I think the way we approach this sort of consumption will have a drastic impact in the way we view the stuff we consume. It reminds me of Last Exile, the value of water, and the strange eats Lavie and Claus had a chance at towards the very end. Except it’s not so populist, just elitist. And maybe this is one place where we can see a clear democratizing effect of internet on media. For one, not only I can buy, without too much effort, special orders that were originally available to Japanese buyers, but even finding out about them in the first place is a big deal. We lose some, but we gain some too. It’s easy to see it in the distribution of anime, but it’s harder to see it in other tracks of the same fandom. I am going to single out figures only because out of all the unopened stuff I own, those take up the most space, and have the most “value” to be opened, and yet I have the most of these packed and unopened… Still, the compulsion to buy figures never really ceases in correlation to accumulated number of figures. At worse it is a problem (again, #firstworldproblem) but that is an issue separate and usually unrelated to the desire to buy the latest pretty thing. I mean, a number of collectors buy figures that they don’t know about just on the merits of a figure’s design and craftsmanship. It’s like getting stone lions for my front doors, except these are nubile anime girls or giant robots (but small-sized) with colors of the rainbow. And typically this habit all started somewhere, probably with some not-so-nerdy-but-a-little-bit dude’s physical desktop (not the one on your PC) where you could put a UFO catcher thing here or a Nendoroid there, it’s kind of cool; like putting a work-friendly-sized photo of your wife (not waifu) on your desk. Then it just goes on from there. Sooner or later you might find yourself in this situation. And then from there it is truly a slippery slope to something like a top scorer on this site, unless common sense or your bank account stops you. The value in this stuff is the aesthetics appreciation, and maybe for some interior decoration, on top of the usual achievements and ticks for collectors. So it behooves buyers to “consume” figures by digging into them. It’s a great “Christmas” effect item. And all of these reasons points contrary to the issue I’m having. And I don’t know why. The only explanation I came up with is that the “savoring” thing I previously describes is the thing I buy figures for. And once you’ve got a lot of them lined up, you probably want to take it easy and slowly. You know, to savor the whole present-opening experience. It’s totally creepy, but it’s the only one that makes sense. That, and I’m running out of display space so I would have to spend some time to make room first. I suppose there is no point reasoning with a man and his 8″ plastic little army of Sabers. This entry was posted on Monday, April 25th, 2011 at 11:06 pm and is filed under English Language Modern Visual Fandom, Figures and Models, Modern Visual Culture. You can follow any responses to this entry through the RSS 2.0 feed. I’ve got no display space left and I’m going to run out of storage space for unopened ones now too. Going to have to go through the horrible task of packing away some of my older ones to make room to display newer ones. Or find a bigger place. I honestly haven’t been collecting DVDs with the same enthusiasm as I used to, though. Mainly I feel like if I’m grabbing a DVD release of a show I watched fansubbed at 720p then I’m paying for an inferior product (even if it’s not really). There’s still very little good stuff released in english on Bluray too. I’ve been importing the Japanese Studio Ghibli BD releases and grabbed the Rakkyo box, but that’s about it for my real collectors releases. I actually sometimes wish that more Japanese BD releases had subtitles. Those subs are surely available somewhere since in many cases the shows are simulcasting on streaming sites, so it always seems wierd to me that the Japanese companies don’t add a simple subtitle track and gain a fair number of added international customers. I guess they don’t want to scare off potential US licensors, but Japanese BD prices are so high that it’s only dedicated collectors that would import them anyway. I guess on the other hand that my wallet probably appreciates the lack of subtitled JP BD releases though. >> I actually sometimes wish that more Japanese BD releases had subtitles.